With Summer in full swing, there's no better way to keep cool than by spending a day at the beach. Whether you're enjoying a weekend getaway with family or catching up with friends over brunch poolside, here are 5 outfit ideas to help you look your best whilst enjoying the sun, sea and sand. 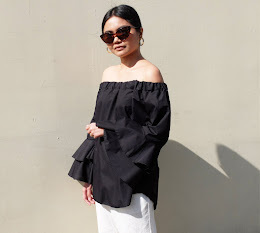 One of my favourite Summer outfits is pairing an off-shoulder top with culottes. Bare shoulders and bare ankles is the perfect combo for keeping cool whilst enjoying an afternoon stroll at your resort. Teamed with a basic white bandeau and accessorised with a straw hat and woven bag, this button-front midi skirt is one of my go-to pieces this season. It's versatile, easy to style and a great alternative to your cut-off shorts. Nothing says Summer like a bright bikini. Add a ladylike touch to your resortwear looks by pairing your bikini top with a cotton pencil skirt. Slip on wedge espadrilles or stay comfy in open-toed flats and you've got yourself a chic beach ensemble. The best way to beat the summer heat? Put on open back tops! And if you're not sure what to wear under back-baring garments, go for adhesive bras to provide you with coverage and support. Got my "Vicky" push-up pair from White Label Bridal Cebu. It's light-weight, washable, made of breathable fabric and has a deep V cut, making it perfect for plunging necklines as well. Show off your gorgeous tan donning a crochet dress, the warm-weather equivalent to your classic LBD. It's great to wear as a beach cover-up and look equally stylish when worn with a slip to a music festival. This multi-coloured number I'm wearing is from the H&M Loves Coachella collection and exudes Palm Springs vibes.